The 'Chrome' a 500 cc hefty machine was released in September 2011. The bike is available only in limited outlets of Royal Enfield in India. The bike certainly depicts the name 'chrome' through its glossy appearance. Its looks have caught the attention of Royal Enfield and Cruise bikers communities and it is one of the highest spoken about bikes especially in the metropolitans today. Being tagged as a leisure bike the features of the bike seem apt for long rides. With most of its body being plated with chromium the bike will surely shine with pride on Indian roads for a period of time. The 499 cubic centimeter four stroke engine uses electronic fuel injection system which is known for its fuel efficiency and stabilizing characteristics that regulates engine emission and also provides better air fuel mixture at various speeds. This is more a requirement for a 499 cc beast that is expected to run for long distances in different road conditions like terrains and steep roads. The bike is equipped with 5 gears to transmit a maximum power of 27.2 bhp and it uses a single cylinder to transmit this high power. The engine is lubricated using a wet sump lubrication system and the bike uses a specific grade of oil for this purpose. The ignition system is of digital electronic type which uses a micro controller. The Royal Enfield Chrome coating on front mudguard, rear mudguard and the petrol tank with the tank having simple graphics is the highlight of this bike. The Chrome is slightly longer and wider as compared to other Royal Enfield bikes. The wide V shaped rider's seat is supported by springs for better comfort and has a tan cover. The pillion seat is detachable and detachment would enrich the beauty of Chrome by exposing its' finely finished rear mudguard. 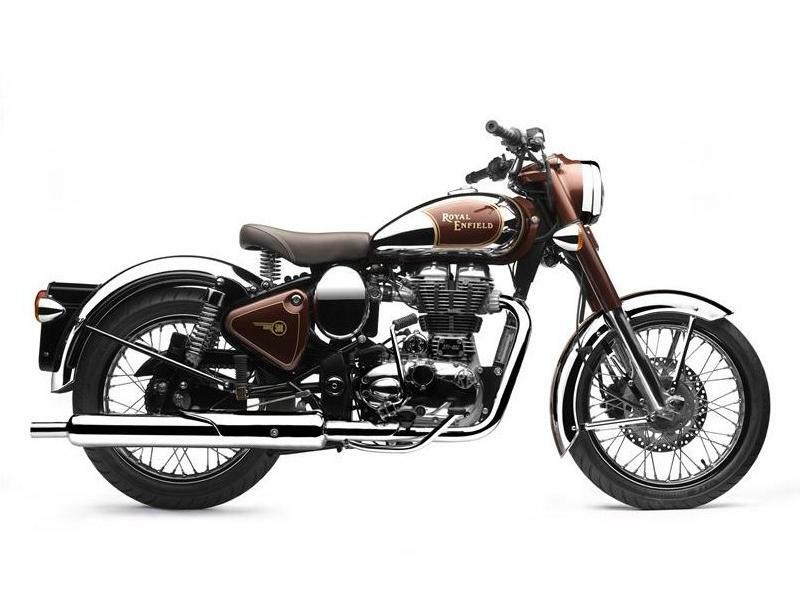 The Royal Enfield Chrome has slightly larger wheel base, wider body, and lesser height with a small reduction in weight compared to its 500 cc counterpart and all these qualities are desirable for long rides. The longer wheel base generally would provide stable and straight line riding abilities on highways at high speeds. The disc brakes operated by piston calipers on the front and the drum brakes on the rear ensure good control of the bike. Telescopic forks on the front end and gas charged shock absorbers on the rear side provide better riding experience and better handling of the Chrome. The 60 watt capacity halogen lamp for head light give good illumination of the road for leisure rides on dark highways. Chrome is a powerful 4 stroke bike with high cubic capacity. The mileage of this bike would be between 25 and 30 on highways and in the cities the bike may run for about 20 to 25 kms per litre of petrol. It has a fuel tank capacity of 14.5 liters. 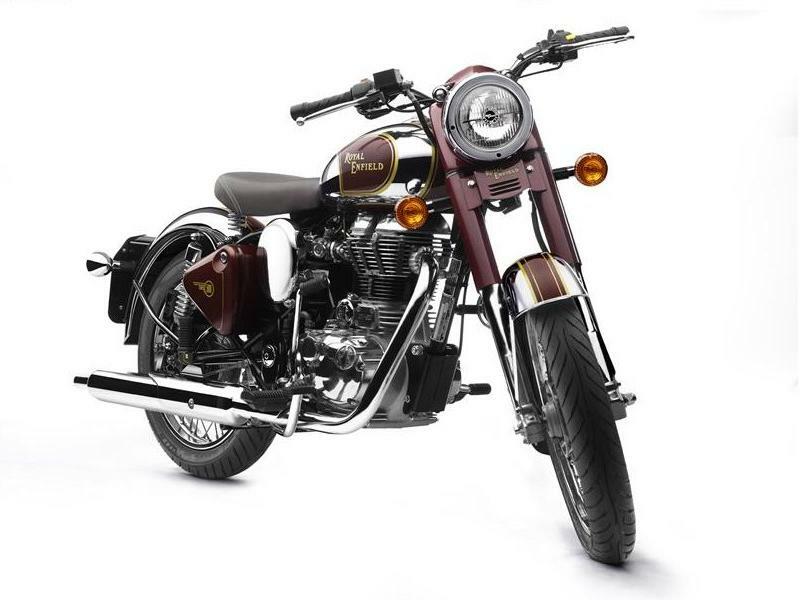 Royal Enfield Chrome is available in two colors that is black and royal maroon. 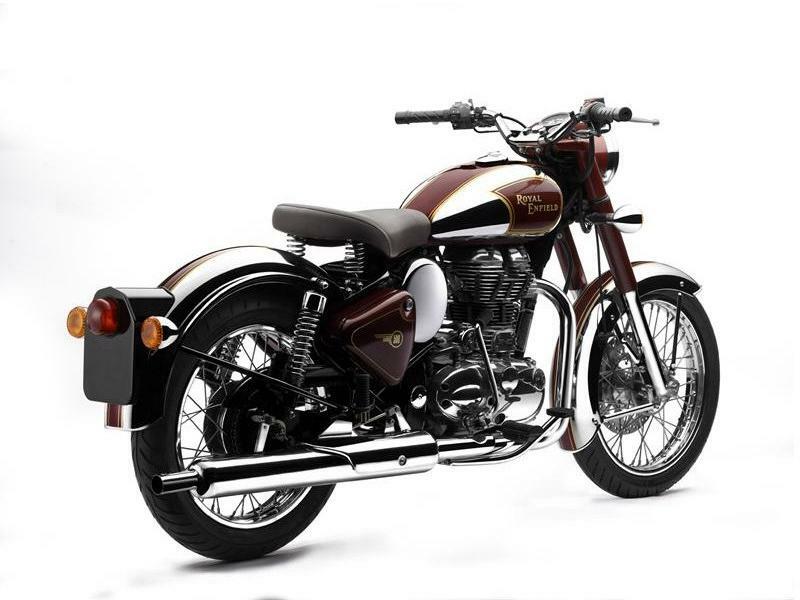 The price of the Royal Enfield Chrome in Mumbai is Rs 1.65 lakhs under applicable conditions.